It’s hard to believe that this is the same country that we have been in for the past month. This trip has flown by! It has been packed to the brim with adventures each and every day. Our past couple of days in Donegal have been incredible; we have visited the Maghera caves and beach, Sliabh Liag and St. John’s point. This place is other worldly. The memories I have from these past few days are ones that will never leave me. When else will I wade through water in my jeans to see a sea cave? Not anytime in the immediate future. Sliabh Liag are the highest cliffs in Europe, and today we ate ice cream at the top. 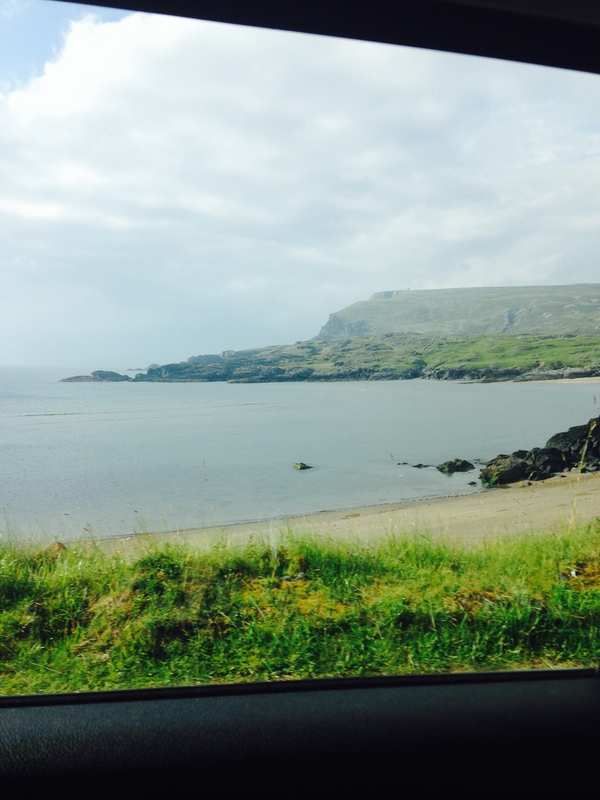 Yesterday we left Galway and made our way through Sligo into Donegal. Obadiah was ready to leave, but I’m not sure about the rest of us. In Sligo we were able to visit W.B. Yeats’s grave. Having taken a class on Yeats last semester, I was floating on air as we entered the church yard. We arrived in Glencolmcille late afternoon and then took a stroll around town. GCC, as we like to call it is an area of Donegal that is basically untouched. The road signs here are not in English and Irish but rather only in Irish. This really connected to one of the plays we read, Translations, by Brian Friel. It was a very interesting play and has played a key role in how we, as students, are experiencing this remote area of Donegal. It’s bittersweet. That’s the only way to describe it. Our time here has been incredible. We really are blessed. See you next time, Galway! p.s. 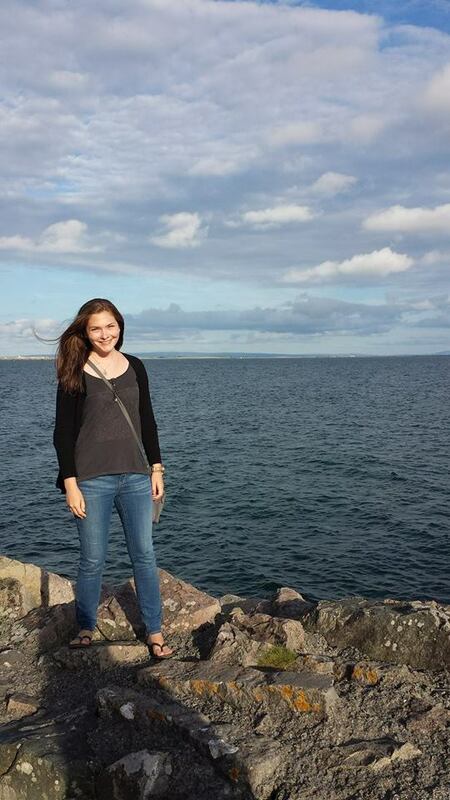 Can I call myself a Galway Girl yet? I’m not really sure how to start this post. This weekend I went up to visit my Dad’s cousins. I took a 6 hour bus ride where I was greeted by my cousin, Mary, and her brother (whom I hadn’t met before). We toured the city that I came into. I saw where many historical events occurred. I had chills. Then we went back to Mary’s house and turned in for the night. The next morning we headed out to the town where my grandfather, Hugh, was born and where he lived until he was 20 years old. We visited: the farm,”Whitehill”; the Church; the school and the top of a hill (pictured above). I still don’t feel like this happened. In class we have been talking about how the land tells a story, and this is where great literature comes from. This weekend, I can attest that this land does indeed tell a story. My grandfather never made it back “home” but my extended family took me in, and their hospitality was unlike anything I’ve ever experienced. It was surreal, but I’ve finally been to this place. I am so glad that this land tells a story. p.s. I even learned my name in Irish. We visited the Galway City Museum. It featured art as well as bits of history. We had the Irish equivalent to Chipotle… it was delish. We went to the Film Fleadh and saw beautiful brick work. Above: Padraic O Conaire statue from the Galway City Museum and the arts council signage from the film fleadh. And last but not least, a selfie. 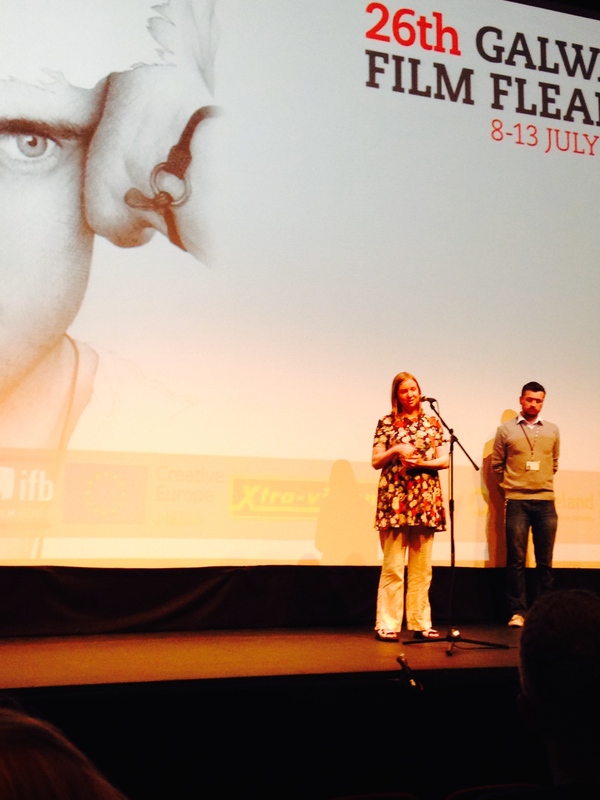 Earlier this evening our group was able to participate in the Galway Film Fleadh. To be honest, I thought we were just seeing a movie as a class. However we arrived at the Town Hall Theater and there were a lot of people there. We received our tickets, sat down in the theater and watched as the movie was introduced. It was the world premier of a movie called, “The Stranger”. It was directed by Neasa Ní Chianáin. The documentary focused on the life of Neal MacGregor who was an English Artist who moved to Donegal and died alone at the age of 44. The movie was filmed beautifully. It really captured the essence of what I think is Donegal. I’ll let you know for sure when I arrive there tomorrow 😉 Anyway, the film was about an hour and a half long and thoroughly enjoyable. Neal’s brother, Stuart, was also at the premier. He helped to answer some of the questions from the Q&A. We learned that those involved in the film only actually filmed for 10 days, the rest of the work was research on Neal’s life. We learned that the place where Neal lived was remote and there are some who still believe he was a spy. There are some who grew to understand him also. The film spoke to that. Neasa informed us that the film would be shown next weekend to the community that Neal lived in. Overall this was a really unique experience for our study abroad group. How many 21 year olds are able to attend an international film festival and see some of the films? Now, I can say I have. Yesterday, July 8, 2014, we embarked on a journey to Dublin for the day. We took the 5:30 am train from Galway to Dublin. Not realizing that a cab ride to the train would take 5 minutes (rather than 20), we left our dorms at 4:45 on the dot. We arrived in Dublin after racing through the countryside at 8am. By 8am we had crossed the entire country. We made our way to city centre, had breakfast and took a bus tour of the city. We used the Hop on Hop off buses, they’re great because they double as mass transit after the first go-around. Some of my favorite parts of the day include: seeing the Book of Kells and the Trinity College Library, seeing James Joyce and Oscar Wilde, The National Art Gallery, and the Guinness Brewery. Trinity College Library. I still can’t get over how beautiful this place is. Certainly makes that MLIS seem like a good decision. Found near the Oscar Wilde statue. I love this quote! Again, another quote. This time in the National Art Gallery. Last but not least, here is one of the many views from the Guinness Brewery’s Gravity Bar. The top floor of the brewery was packed. This is where we were able to get a spot. Way in the distance, you can see the center of town (and the point!). The brewery was a really cool place to visit. It was a little disney-esque, but still very cool. Then we walked back to Heuston Station and took the 6:30pm train back to Galway. We arrived “home” at about 9pm, had some dinner and went to sleep. An exhausting day, but very much worth it to see Dublin. It’s funny. 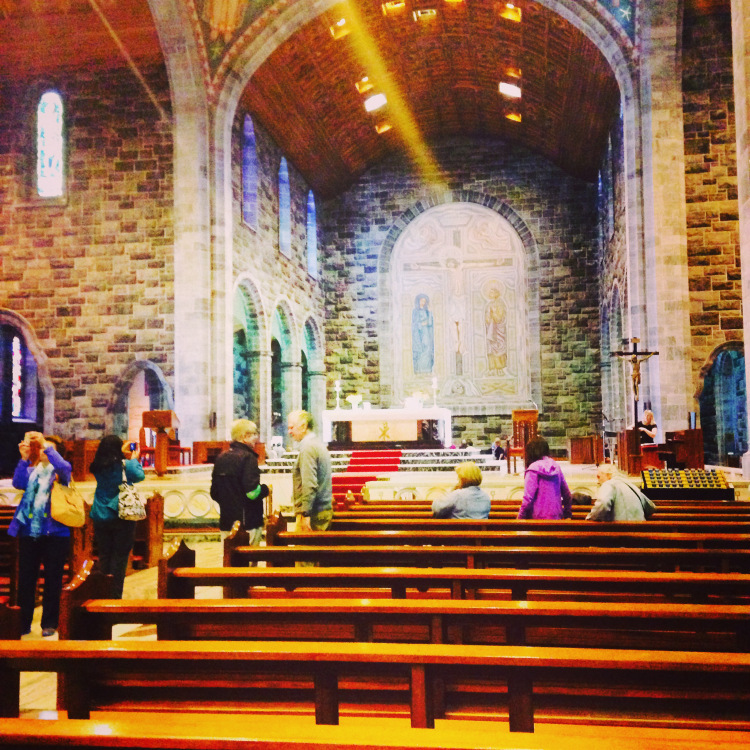 Since I don’t have a car here, or easy access to daily mass, I’ve become extra grateful for Sunday mass at the Cathedral here in Galway. The Cathedral is absolutely beautiful! And, off to the side there is a small chapel for adoration. My goal is to make it to a daily mass here before I leave. Hopefully that happens. My sleeping schedule is a little off (still). I usually don’t get out of bed until 11am and don’t make it to sleep until after 2am. Fun? Eh. Not really. I’d rather be up early. I’m working on it. However, yesterday’s Gospel really hit me. Last night our study abroad group met at the Bank of Ireland Theater on NUIG’s campus for an evening performance with An Anù and Sonke Multicultural Community Choir. Both groups used elements of African music in their performances. An Anù also performed some traditional irish songs. This event was free with the opportunity to donate to Amnesty or to the Sonke Choir. Tomorrow we make our way to Dublin! Please keep us in prayer as it is only a day trip!